Breitling's original Emergency watch first launched back in 1995 and was able to broadcast a distress signal on the 121.5 MHz analog band allowing ships, planes, and other vehicles to track it. But if your approximate location wasn't already known, it made locating the signal a bit tricky. 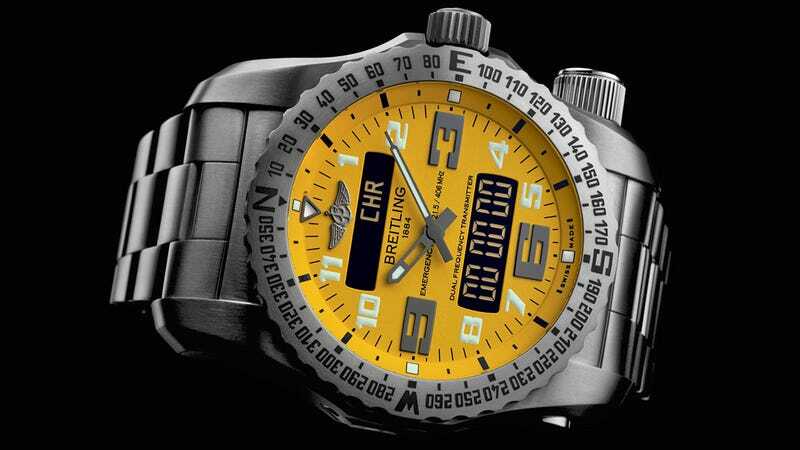 So Breitling is introducing an upgraded version of the watch—the Emergency II—that adds the ability to send a distress signal to satellites circling overhead, so no matter where on Earth you're lost, you can be found. The Emergency II still broadcasts a 121.5 MHz analog signal, but that alternates with the new 406 MHz digital signal which can be tracked by the five COSPAS-SARSAT search and rescue satellites. To ensure the signal isn't accidentally triggered, the user has to pull out a set of long antennas on either side of the watch, and the emergency signals will alternately broadcast for up to 24 hours with the Emergency II's built-in rechargeable battery.